Q: How to set a password for the flipbook? At some times, to set a password to protect documents is very necessary. This is a practical way to protect our ownership. You can even define the protection range. Thus, it is more convenient for the most users. Please reference to the below tips. Step1: transfer the panel in the left to “Design Setting” panel. 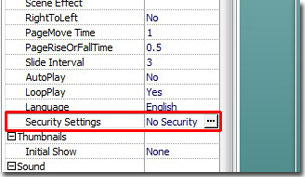 Step2: find and click the “Security Settings” bar under the “Tutorial” group to open the “Flash Security Config” window. 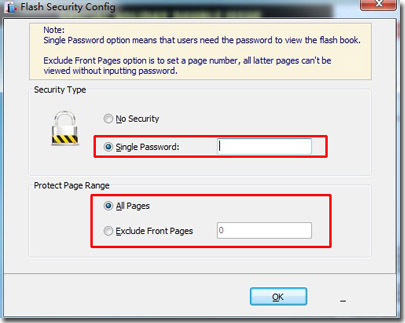 Step3: check the “Single Password” option for the security type. Fill in the protect page range according to your needs. 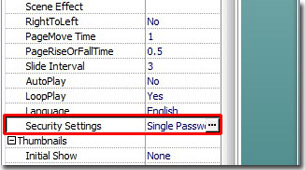 After that, you will find that the value of the “Security Settings” bar has been transferred to single password as below.